“Meaningful fiscal deterioration” — Moody’s serves notice on spendthrift D.C.
“With the bleeding in stocks stopped, we could easily see a rebound reaction,” Alan Knuckman said after the close on Friday. This morning the Dow is up 200 points as we write — on top of the 300 points gained on Friday. We won’t belabor the point, but amid the market turmoil last week, Twitter posted its first profit… and Alan’s Weekly Wealth Alert readers booked a 235% gain in 72 hours. He recommended a new trade this morning with payoff potential no longer than three weeks out. Because these trades move so quickly, we can’t guarantee it’ll still be a “buy” tomorrow. For that reason, we’re taking this presentation about Alan’s short-term trades offline at midnight tonight. We pause here to note a momentous anniversary in recent market history: Two years ago yesterday, the market put in a bottom that it hasn’t revisited since. 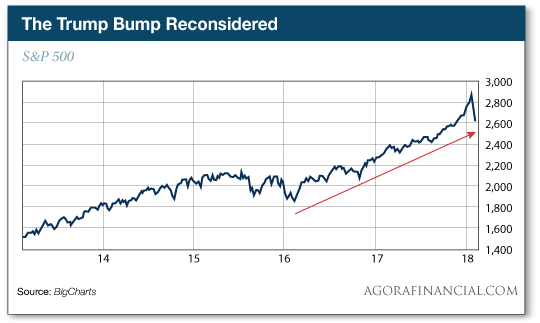 As we pointed out now and then during 2017, the “Trump bump” was in no small part a continuation of the rally that began nine months before his election. It’s just that 2017 felt different because there were no pullbacks of even 3%. By contrast, 2016 brought meaningful pullbacks after the “Brexit scare” in late June and again in the run-up to Election Day. Note: The “uptrend” represented by that red line would still be in place even if the S&P were to take another spill in the coming days and weeks to 2,400. “Turns out there’s order in the chaos,” our resident quant Jonas Elmerraji says of the market’s recent action. 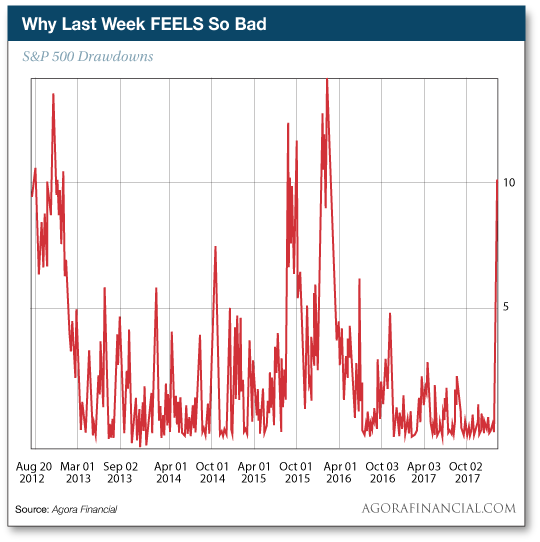 “For starters,” he explains, “there’s the fact that we had two one-day sell-offs of around 4% in the S&P 500 last week — Monday and Thursday. “That certainly sounds insane. And plunges that big are statistically pretty rare — only 1% of trading days since 1987 have ended 3% lower than they started. “The chart above,” Jonas explains, “shows drawdowns in the S&P 500 from mid-2012 to today. Drawdowns basically measure pullbacks from all-time highs. The correction we’re currently experiencing is the spike on the right edge of the chart. “As you can see, corrections happen quickly. The drawdown we’re in now is fairly indistinguishable in size and speed from the ones in 2015. They’re also pretty evenly spaced — the S&P has lost more than 10% of its value every three years or so. It’s not only stocks regaining their mojo this morning: Gold is finally back on the rally tracks. At last check the bid is up to $1,323. Crude is recovering a bit from last week’s smackdown, but a barrel of West Texas Intermediate remains below $60. Treasuries are selling off, the 10-year yield once again 2.85%. No major economic numbers today, but they’ll come fast and furious on Wednesday and Thursday. From our lips to Moody’s ears? To be clear, Moody’s is not threatening to downgrade Uncle Sam from AAA the way its competitor Standard & Poor’s did in 2011. But a bond rating also comes with an “outlook”… and Moody’s implicitly threatened to adjust that outlook from “stable” to “negative.” That would send tremors through markets worldwide. As a reminder, the budget deal signed into law Friday suspends the debt ceiling till March of next year. The ceiling came back into force on Dec. 8, so since then the national debt has held steady at, give or take, $20.5 trillion. The Treasury will update those numbers tomorrow or Wednesday. It will be fascinating to see how much the national debt grew in three months. It turns out one of the Trump nominees for the Federal Reserve’s Board of Governors is an ardent advocate of the War on Cash. He’s Carnegie Mellon econ professor Marvin Goodfriend. Goodfriend turns up in a Wired story from 1999 that’s being recirculated online this week. The good news: Goodfriend’s nomination is in trouble in the Senate. Every Democrat plans to vote against him and so does Kentucky Republican Rand Paul. That means Vice President Pence would have to be the tiebreaker… assuming no more Republicans defect. As “dumb criminal” stories go, this one has it all — including nukes and bitcoin! Well, on one level, it makes sense. Mining crypto is hard work. It takes a lot of computer power and a lot of electricity. If you have access to your country’s most powerful supercomputers, why not siphon off a little bit of that computational power for a little profit on the side? Alas, if the official accounts are to be believed, these nuclear researchers are not — shall we say — rocket scientists: To keep hackers at bay, the supercomputer in question was not connected to the internet. As soon as the researchers hooked up the computer to the net to start mining, they were found out. Russian media say the attempt went down at the Federal Nuclear Center in Sarov — a “closed city” created by the Soviets exclusively for nuclear research. For a long time, the place never appeared on Russian maps. To the mailbag: “One of the things I find most interesting about all of the various dailies I receive from Agora is that no one is even considering that maybe this isn’t a simple correction. “My question would be if you knew in 2007 that the degree of the downturn would be what it ended up being, would you have said the same thing at this early stage? Do you have a means of measuring when the market is ready not for a correction but for a major bear market? Look, we’re one of the few outfits that had the foresight to call BS on the housing bubble — and the credit bubble that went along with it — well before 2007. What’s more, the earliest iterations of our sister e-letter The Daily Reckoning were warning about dot-com stocks in 1999 — a rare voice of caution amid the frenzy. So we’ve got some chops when it comes to anticipating major market dislocations. As we said last week, it was easy in the mid-2000s for us to advise readers to pile into precious metals and energy as an alternative to the broad stock market. There’s no such obvious alternative now, although we’re certainly on the lookout. If you feel better hiding out in cash and gold at this time, go for it. But we have other readers whose nest eggs aren’t big enough to give them that option yet and we’re trying to attend to their needs too. P.S. Last chance: Access to this link — with details of a system that could dramatically change your retirement for the better — goes down at midnight tonight.